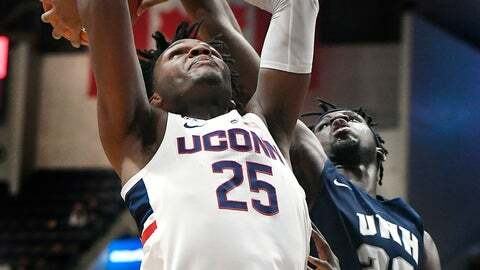 HARTFORD, Conn. (AP) — Josh Carlton and Jalen Adams each scored 17 points and UConn routed New Hampshire 91-66 on Saturday. “We’ve done nothing the last couple of years and we’ve done nothing this season to warrant us overlooking anybody,” said coach Dan Hurley. Hurley announced that forward Sid Wilson will be eligible to play for the Huskies on Tuesday. Wilson, who sat out last season after transferring from St. John’s, was suspended before the start of this season for an unspecified violation of university policy that took place last year.